More and more, new cars are being sold on the strength of their in-vehicle infotainment systems. Whether this is having the latest navigation system, video players for keeping younger passengers quiet on long drive, USB and Bluetooth connectivity or Wi-Fi connectivity so passengers can access social media, browse the web or make video calls, one particular feature is far and away the most important component: the audio system. The BEEAs aim to demonstrate and promote the quality of engineering design within the UK, and emphasise innovation and effectiveness of smaller companies enabling them to compete on equal footing with larger ones. With a high level conference, free practical workshops and an exhibition demonstrating and promoting cutting edge technology and innovation, the Engineering Design Show is the only event providing for the needs of the UK’s design engineers. Engineering Materials is the place to find out about all things happening in the materials world. We regularly update our features, news, videos, blogs, tweets and more to bring you the latest coverage on everything from composites to coatings. Manufacturing and Engineering North East is a show unique to the region that offers visitors the chance to see, hear and discuss the latest engineering and manufacturing developments. The show was launched in 2015 to not only champion the UK engineering and manufacturing sector, but also to provide a platform from which to build on the region's successful industrial heritage. Established more than 40 years ago, New Electronics is the electronics industry's leading magazine and a central hub for design engineers. New Electronics keeps designers and managers up to date with the fastest moving industry in the world. 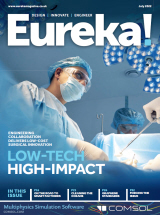 Download your copy of Eureka magazine here. Request your magazine through the post.